Applecross Rotary launched its Mental Health project in response to a presentation by a member whose brother died by suicide. Unfortunately, this story is all too common. In 2016, 2,866 Australians committed suicide – a far greater death toll than that caused by motor vehicle accidents. 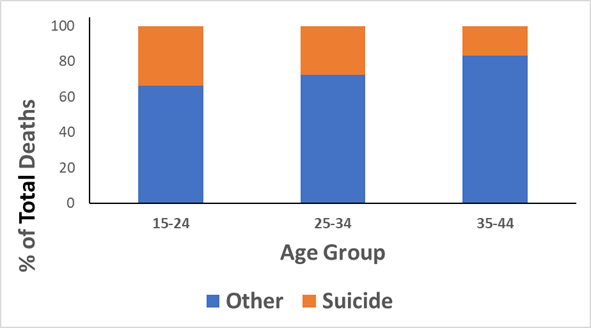 Most suicides are men (75%); suicide remains the leading cause of death in young Australian men. Approximately 87% of people who die by suicide have a diagnosable mental illness at the time of death. Many of these deaths may have been prevented, if signs of struggle were identified earlier, and appropriate treatment received. We are losing seven Australians to suicide every day; we can do better as a community; and more needs to be done. A Club Committee investigated a range of possible projects and have concluded that educating and thereby upskilling the community in mental health literacy would empower people to talk about it more openly and reduce stigma. A proposal to establish and deliver a community-based Mental Health First Aid training program was chosen as the Club Project. This training enables people to identify potential mental health problems; take appropriate, evidence-based action to prevent escalation in a crisis; and provide people with useful information and support so that they can find the right professional help. During 2017-18 Project leader Jarrad Hall has, after several false leads, been able to identify a potential trainer/coach who is receiving basic training by the Scouts. This person will require additional specialist training that will be funded by Applecross Rotary. When this is completed regular training sessions for youth leaders, workers, junior sports coaches and other in contact with young people will be held.